Above: Overview of Swiss Heritage Village, Museum, and woods. Willkommen to Swiss Heritage Village! 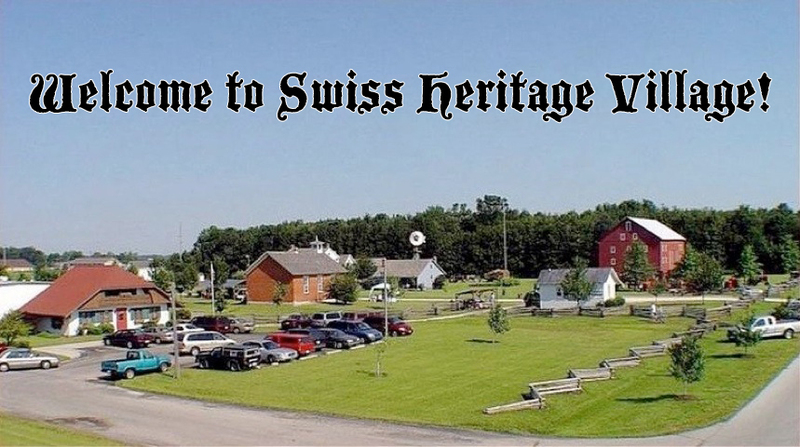 Welcome to the Swiss Heritage Village & Museum website! Chartered in 1985, the Village is now the largest outdoor museum in northern Indiana. As you visit our site and read about the buildings, grounds, and events sponsored by the Swiss Heritage Society, you will learn about how the Swiss settlers lived in this area more than a century ago. We hope you will come to understand the appreciation we have for the culture of our ancestors. See you soon! not open on Sundays or holidays. We welcome children under 6 for FREE! Swiss Heritage Village & Museum will be open to the public beginning Saturdays in May, and we are open daily–except Sundays & holidays–from June 1 to October 31. Groups with advance reservations are welcome as early as April. Just call 260-589-8007 to schedule a weekday tour. We welcome guests between the hours of 10 AM and 4 PM. To spark and sustain an interest in the Swiss and Christian heritage of Berne, Indiana and southern Adams County by promoting learning through discovery. Swiss Heritage Society would like to thank the area volunteers for their endless hours of work and support. Our volunteer program is designed for people to come and enjoy their hours of work, as well as to provide a much needed effort. Volunteers are essential for the smooth daily operation of the Village and grounds. We extend an “open door” policy for any suggestion to better or beautify our Village. We are always extending a hand to anyone who would like to donate their time to help us with volunteer opportunities involving groundskeeping, leading tours, and even being part of our events. All images and text © 2019 by Swiss Heritage Society. Please use only with permission.